While doing research for these Christmas pages I became increasingly aware of the important part played by forms of gambling in the Christmas scene in Jamaica for several decades at the end of the 19th century. 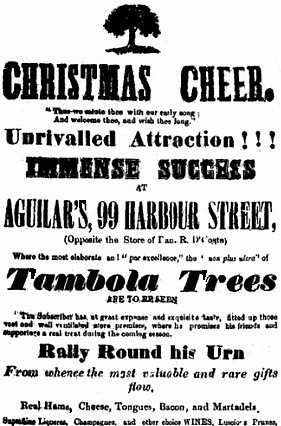 The frequent references to lotteries, 'tambola trees', 'Christmas trees' and 'raffling' illuminated a topic to which I had previously seen only passing reference; in fact most accounts of old-time Jamaican Christmas do not seem to mention it at all. H G de Lisser wrote in 1912 of Christmas in Kingston as he knew it in the early 1890s, when as a young teenager he had left Falmouth and come into Kingston to find work after the death of his father. At first he found work in stores around Parade and on King Street, before moving on to the Institute of Jamaica and then the Gleaner, Times and Telegraph. He was following in the footsteps of his journalist father, and at the same time honing his own journalistic skills and acquiring his profound knowledge of Kingston life at all levels. Christmas in Kingston some twenty years ago began on the first day of races, and from that date until about the sixth of January high revel held its sway. There were not so many race meetings then as now, hence the December races were an event; for two nights and three days hundreds of people camped out on the course; they pitched booths there, had their meals there, fought there, and altogether enjoyed themselves. It was a delight to see the course at night: A thousand lights gleamed on it; everywhere were groups of three, four, half-a-dozen folk; the scent of food hung upon the air, guitars were twanged, songs sung, merry-go-rounds swung merrily around, pedestrians walked to and fro, the bars did a lively business. Now and then you would hear the cry, "Soger coming!" - that soldiers from camp were making a raid. Then there would be a wild rush in one direction and another, a precipitate covering of goods and chattels, a scream for "police", a confusion of noises, a babel of tongues. But these alarms quickly passed away, and in spite of them the people of the city would throng to the course. It was the beginning of Christmas, the opening of the season. Down in the city other preparations were being made. From North Street to the Parade, along West Queen Street, Barry Street, Tower Street and elsewhere the shops were decorated. Festoons of coloured paper were hung overhead, the walls of these little places were adorned with oranges and evergreens, the shelves stocked with ornaments, crockery ware, bottles of liquor, tins of jam, meats, fish, while blackboards covered with playing cards were stuck up against the walls. Every shop was a blaze of light. A whole street would be transformed in a few hours. And as you walked along it you would hear the rattle of dice and the cry of the men in charge. “One is up, one is up”. “Two is up, two is up,” and so on. Raffling had commenced. Raffling was a great institution then. You bought a ticket for a quattie – “One was up.” Someone else bought another ticket – “Two were up.” Perhaps it was a tin of jam that was to be raffled. The selling price was sixpence; buying the jam wholesale the keeper of the raffling shop may have got it for fivepence. He raffled it for ninepence thus six men had to be “up” before the raffle commenced. You see the shop bright with light, gay with colour, crowded with people. From all parts of the street came the same cry: “One is up.” “Two is up.” “Three is up”; from all quarters of the neighbourhood came the sound of rattling dice, up and down the street h[urrie]d crowds of pleasure-seekers. Have a chance? Three is up: you plank down you pence, grab the ticket thrown to you – “four is up.” You? “Five is up!” Take another chance for luck? “Six is up!” Begin. You first? No? You then? You don’t mind! You grasp the slender elongated pan, shake it swiftly, throw out the dice – from fifteen to twenty heads are peering forward to count the number you have thrown. Fourteen. Not so bad that, yet easily beaten. The next man shakes the dice, throws – ten! He is out of it; shakes his head to signify that he expected to be beaten; and the next man throws. Twelve. The man who has thrown fourteen brightens up. Only three more to follow, and lick may be with him. The fourth man throws: fourteen: “tie!” shouts the crowd. These two will have to fight the battle out if no one throws a higher figure. The fifth man plays sixteen! Only one left now, and sixteen is hard to beat; the highest number you can throw is eighteen, and very rarely indeed do seventeen and eighteen come. The last man feels that his chance is poor; shakes the box and throws with a half-despairing movement. Fifteen - beaten by one! The tin of jam is planked down on the counter before the winner. He does not want it; then "the house" will buy it back, but on "the house's" own terms. "The house" pays the winner threepence and gives him a ticket for the next raffle. Thus one again is up, and the profit of “the house” has been enormous. Fights? Oh, yes: there were quite a few. I am not aware they were particularly serious, for the noncombatant portion of the crowd generally separated the belligerents before much damage was done. But sometimes a shop would be wrecked, the proprietor hastily summoning the police and banging his doors to, if he could. Thoughtful men would hang about these raffling shops in the hope of a scramble, for at such times and on such occasions a man who was swift might reap a handsome reward. A quick dive at the till, for instance, might handsomely repay the venture: at the very least a couple of tins of fresh herrings might recompense perseverance and enterprise. If you did not care for the raffle you could try the lottery. The cards stuck by pins into the blackboard had each a number, and you were assured that some of those numbers indicated magnificent prizes. Threepence for each “touch”: you paid your threepence, took the pointer, touched. Blank. Nothing daunted, someone else touched. Cup and saucer. The market value of this was threepence and as the crockery had been purchased wholesale, the house [made] a small profit. Some other persons take a chance in the lottery: blanks and small prizes result. The enthusiasm of the crowd wanes. The lottery seems a cheat. We all hang back. Oh, doubting hearts! – for look, this bold, desperate, determined fellow will now tempt fate: he throws his threepence down, touches a card: prize 4/6. A murmur of surprise, admiration, envy: some others will venture now. But no other large money prizes are won that night, and if you return to this place again you will observe that it always is the same man who, when the crowd grows suspicious, steps forward and wins a splendid prize. He is there to win prizes. His special function is always to be lucky at a lottery. “One is up, one is up, one is up” – it was gambling, but it made Christmas very bright. It gave the streets a holiday appearance. And even the lotteries were not all cheating. I know a gentleman who won ten shillings one night. I know others who won. I know people who went home with an armful of things got at the raffles. It was not street boys alone that took chances: men in decent positions also did: it was fun and they enjoyed themselves. You might lose a few shillings, but you got the excitement, and it was the excitement that many people raffled for. But reformation came in a flood, raffling was forbidden, the shops ceased to decorate themselves before Christmas Eve. The lights, so to speak, went out. Then came the end of the December races in Kingston, and this too struck a blow at Christmas joy. Another class of entertainments were organized. They called themselves Garden Parties and Carnivals: they were respectable and dull. 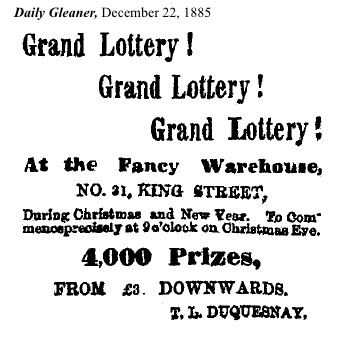 There were a few lotteries noted in Kingston between 1868 and 1871, but these had no special connection with Christmas. It will be useful to find references to the carrying on of lotteries in Jamaica in the 18th and early 19th centuries, a period when lotteries were all the rage in Britain, Europe and North America; I am sure these lotteries must have taken place, but so far I have not been able to track down references. If any reader can point me in the right direction on this I shall be most grateful! The lottery in 1868 was in aid of the Central Park (presumably on the Parade) and was under the patronage of the Custos of Kingston. The advertisement promised that ‘A Lottery Tree will be reared and a large lot of excellent Prizes offered for competition. Tickets for the Lottery at 6d each, will be disposed of during the evening'. In 1869 the lotteries were part of the farewell performance for Signor and Signora Bianchi, popular visiting singers; the prizes were pieces of jewellry, a watch and a book of poems. By the Christmas of 1871, however, the idea of the Christmas lottery, in the form of a Christmas Tree, appeared to be already well accepted. 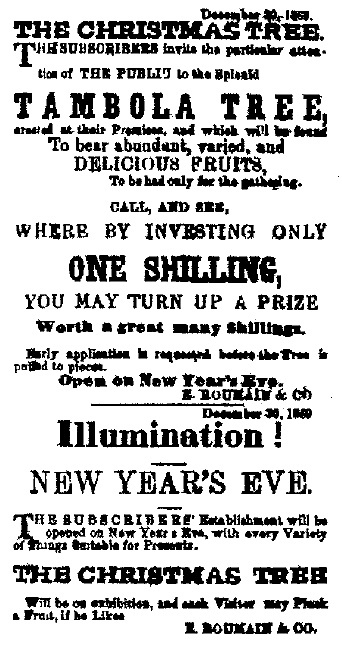 These two advertisements from Christmas 1871, provide examples of the type of attraction that became increasingly popular in succeeding years. The references to 'prizes' and 'numbers' clearly indicate that the gifts on the trees were allocated by some type of lottery, usually the buying of numbered tickets. 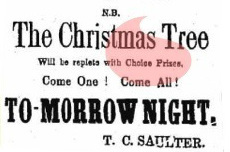 Gifts on Christmas trees at functions for children, especially when connected with churches, were usually distributed by local dignitaries, but even on these occasions were sometimes distributed on the basis of numbered tickets. In the following years the enthusiasm for the lotteries grew. In 1872 the Commercial Hotel and the Model Grocery advertised lotteries. The Union Drug Store, 18 King Street, claimed in its advertisement that 'THE ANNUAL UNION CHRISTMAS TREE has been got up with great care and a variety of good things well worth a trial this year', suggesting that this was not a new venture. 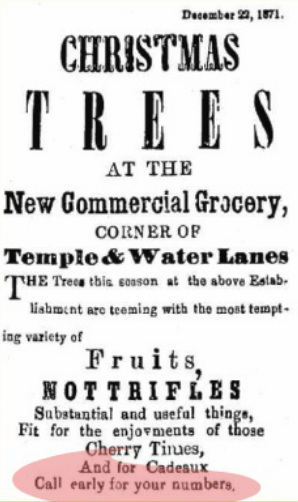 The proprietor of the Model Grocery on King Street tried out two names for the Christmas lottery - Cornucopia and Yew Tree - but they do not seem to have caught on; the terms that were current in the succeeding years were 'Lottery Tree', 'Christmas Tree' and just plain and simple 'Grand Lottery'; in 1875, to add to the confusion, the term Tambola or Tombola Tree was added to the mix, though the actual operation seems to have been the same. With a view to prevent disappointment and relieve the immense rush upon the Cooper Hall, in the Evenings throughout the present week, the Christmas Tree Drawings will be continued during the day, so that families and young children may attend without inconvenience or unpleasant crowding. In the Evenings it is proposed that only those in possession of Tickets will appear in front at the Counter, as the crush is rendered distressing by persons crowding forward who have no other interest in the proceedings beyond mere curiosity. To secure better order and regularity, the distributors of prizes will in future keep their own division of the Counter which will obviate the necessity of Ticket Holders calling on others appointed to other divisions to attend to them. The utmost dexterity will be used in furnishing prizes, but Mr. Gall appeals to the good feeling of the community, not to harass those so anxious to serve them, by a hundred persons calling at one time to be attended to. The distribution of prizes requires great care and accuracy to preserve order, and it is alike painful to Mr. Gall and his assistants that in their best efforts to please all who patronize the Christmas Tree, there are at times very undeserved reproaches for delay and inattention. Mr. Gall therefore appeals to the public to assist him in the orderly disposal of the 12,000 Prizes he has prepared for distribution among them. Tickets purchased in the Evening will be honored at any time during the season so there need be no unnecessary pressure on the Counter if there is too great a rush on the Distributors. 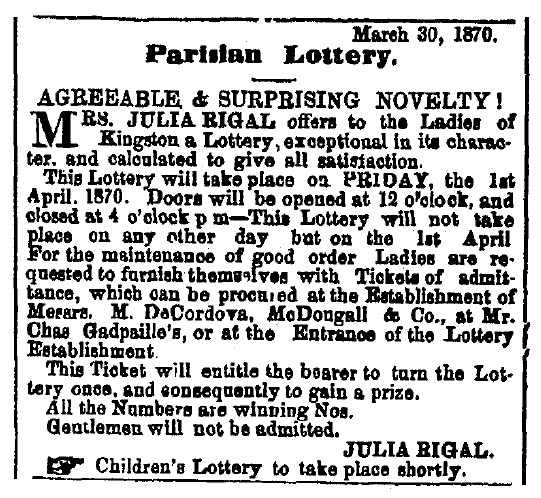 Although A. Mordecai & Co. had optimistically advertised items suitable to raffle or for lottery tables, there were no lottery tables or raffling publicly in Kingston, or anywhere else presumably, in 1876 and 1877. Interestingly there was a notice of the ban on lotteries on the same page as the Mordecai advert! Gloomily comes Christmas upon, us in this present year. The feeling of depression which pervaded the last months of the previous half year, has been intensified by the occurrences subsequently in our world. The extremely low price, in the principal markets of the world, of our chief staple export during two years, has told fearfully upon everyinterest and upon every class in the Island. And although an extraordinary bound, an almost miraculous leap, has been made in the opposite direction, its effects for good have not yet been apparent. True, so far as Kingston is concerned, the past fortnight or three weeks, with their usual influx of strangers from all parts for the races and the holidays, have exhibited more liveliness of trade. But, to the close observer, the fact stared him in the face, that, beyond the strangers who must necessarily have brought money to spend, there was no one else who shewed signs of plethora of cash. All Kingston proper, it may be said, had little to spare, beyond what was required for the ordinary calls of every day living. It would seem as if, all of a sudden, a whole community, has become pauperised. We may have reason to hope, however, that the cloud of gloom which now broods over commercial affairs will soon be removed and that the very remunerative price at which our sugars are selling will continue for some time, and enable us to recoup past losses. If there had been lotteries and raffling tables the whole community might, surprisingly, have appeared far less 'pauperised'! 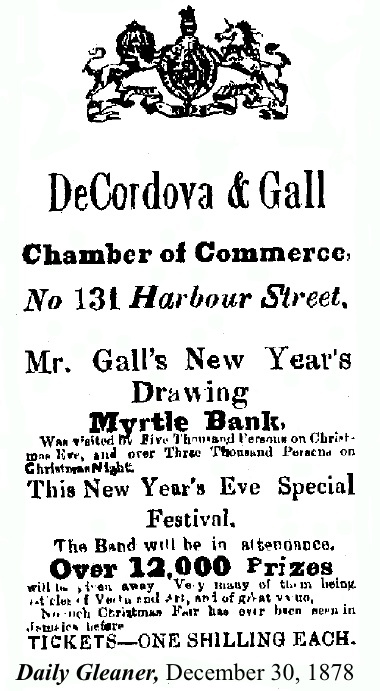 1877 was another unsatisfactory year it seems, and on Christmas Eve an editorial writer commented: 'The world, it is true, goes at such an “express speed” in matters of business, that it may miss the excitement of sensuous and sensual gratification which used to distinguish the Christmas holidays of forty or fifty years ago. The John Canoing of the day, and the Masquerade of the night, in those days gone by, are no longer here; but we have still the spirit of life left with us to enjoy ourselves.' And there were still no lotteries to liven things up! It has been suggested to us that the law which prevents lotteries at this season of the year is objectionable, because the lotteries, as they existed in this country, were but innocent amusements, and that nothing can supply the place. If so, the remedy lies in the Legislature; and the Police are not to be blamed for carrying out the law as they find it. There is much to be said on both sides of the question. SIR – The petition which accompanied your note, dated the 28th of November, addressed to the private secretary, supplemented by the enclosures in your letter of the 2nd December, has been laid before the Governor, and His Excellency has desired me to say in reply that the order to which the petitioners refer as having been rigidly carried out for some years, is probably a warning which was issued by the Police in the early part of 1876 in consequence of an expression of opinion as to the strict legal construction of the old, but still extant, Lottery Law, which had been forced from the Government, by a formal representation, as to the legality of the practice of holding lotteries; but that more recent order, which the Governor saw occasion to issue, in the course of this year, may not interfere with such harmless drawings as you apparently contemplate. The Gleaner felt that this response disclosed 'a spirit of liberality on the part of His Excellency the Governor, in striking contrast with the narrow views that formerly prevailed in the Executive'. Apparently on the basis of this response, raffling and lotteries were able to flourish at Christmas for two decades, until new and restrictive legislation on gambling was passed by the Legislative Council, in 1899. Local businesses quickly got back into the swing of providing wholesale the items which retailers used for their raffles and lotteries, as the advertisements below illustrate. 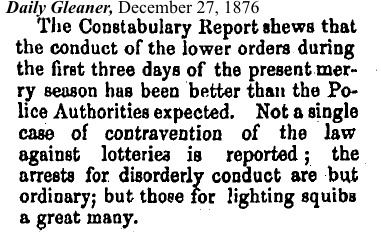 Before the Christmas season even began, the Gleaner got rather heated about the iniquities of the lotteries and those who ran them! The approach of Christmas and its festivities induces us to draw the attention of the Government to the illegal lotteries which take place in this city daring December. Some time since, the authorities very properly put a stop to gambling on the Race Course during the races, on the ground that the practice was demoralizing, pernicious, illegal, and too frequently led to dishonesty among those who speculated beyond their means; and surely what is good for men is equally applicable to the boys and girls, who are induced by the glittering prospects of some big prize to invest shilling after shilling in lotteries, and thereby enable the proprietors to dispose of, at a shilling, cheap, trashy articles which at the outside probably cost a quattie. We know the city of Kingston is a model place; that the “managers” of the lottery swindles are incapable of not being able to find a "prize" when it has been won; that in their philanthropy they take care that there shall be all prizes and no blanks, and above all that the moral influences surrounding their “catch-pennies” is so great that there is not the slightest inducement held out to girls and boys to steal a shilling in order to take a chance; but at the same time it is hardly worth while for the authorities by their silence and inaction to tacitly countenance an open violation of the law. We have heard a good deal said about a certain * Art Union," where the principal display of art, so far as we can learn, consisted in getting the money first and then not being able to find the prizes which were drawn; and some people were unreasonable enough, to complain forgetting apparently that it is only a “peculiarity” of the manager. But apart from any such "crooked practices," for it is not every one who would engage in them and swindle children, we take the broad ground that lotteries are illegal and should be put a stop to They are a fraud by which "Sharps" are enabled to injure the businesses of honest dealers in children's toys, books, trinkets, &c., and we respectfully suggest that the Government should put a stop to them in the interest of public morality and honesty. One of the lamest excuses we have heard advanced by the advocates of the illegal lotteries, which annually take place in this city, is that the people have so few amusements, and that is one of the most harmless amusements they can engage in. By the same line of reasoning there was no harm in the roulette table used under the grand stand at the Race Course, yet that was prohibited. In the one case as the other persons stake their money on a chance, and we fail to see the difference between a roulette wheel and the so-called wheel of fortune, except, if anything, that the former, which has been prohibited as "gambling," is the most honest of the two. But if it be true that lotteries are an amusement to the people then they are amusements of pernicious and demoralizing nature, which should be stopped. If they were so good and harmless in their nature, why is it that the authorities in England put them down and passed such stringent laws for their prevention? 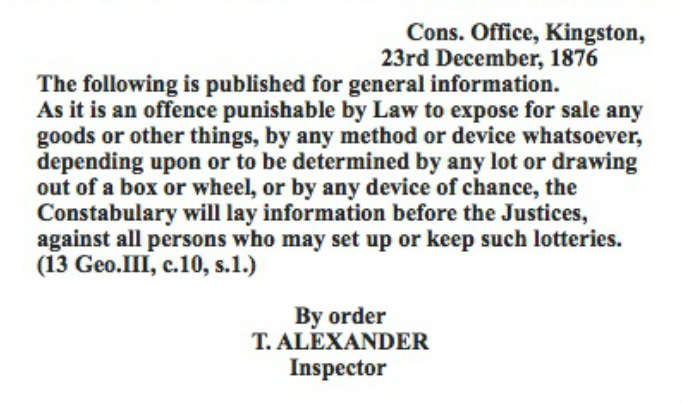 Doubtless it in a very profitable source of enjoyment to those who manipulate them, and they will probably resort to every subterfuge to evade the law if those responsible for its enforcement should require them to obey it, but still we submit that is no justification for permitting its open violation. The encouragement of such "harmless" amusements fosters a taste for gambling in the youthful mind, yet when those youths grow to manhood and become gamblers, people who are indirectly responsible for the result raise their bands in holy horror and say "how shocking" We are perfectly certain HIS EXCELLENCY would regard with anything but favor a young man who was in every respect eligible for appointment to a public position, but was known to him to gamble, and yet the habit may have been fostered simply from the encouragement of "harmless lotteries" in which in his youth he annually took his chances. We unhesitatingly assert that the lotteries carried on annually here are a crying shame and disgrace to the city, and should be prohibited regardless of the persons who get them up or the object sought to br accomplished by the receiver of the ill-gotten gains. With the first day of races the Christmas holidays are supposed to begin. In days not long gone by the raffling shops of Kingston would formally open on the night of "races day," the principal streets of the city would be one blaze of coloured lights, while the rattle of dice boxes and the continuous shouts of "One is up, two is up, three is up" would break, not unpleasantly upon the ear. Crowds of people would throng the streets, and from houses here and there the cheerful piping of a flute and the squeak of a violin would come. We have changed all that now. Raffling has been declared intolerable in an enlightened city. Silence reigns where cheering once prevailed, and dullness is the general order of the day. Even the races take place at some distance from the city. Christmas enjoyments become more expensive. And, to complete the story, the police have now received instructions to arrest anyone found firing squibs upon the streets. I am reminded of another incident which I witnessed in the days of my youth. In those days a Kingston rather different from that which we now know existed. 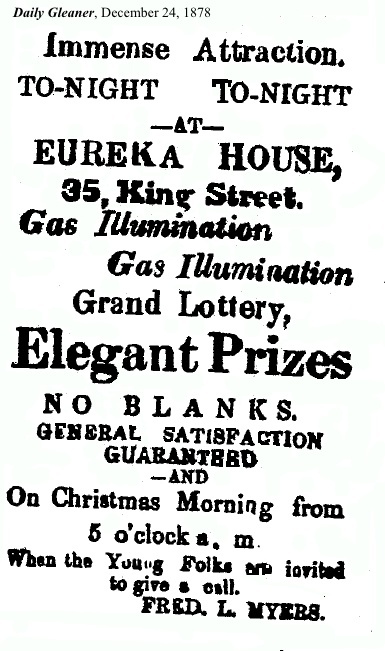 There were then no Sweepstake Lotteries in which "If you haven't a ticket you haven't a Chance;" but about Christmas time and for some days after any place could have an open lottery, and hundreds of shops in Kingston took advantage of this permission for open gambling. On a blackboard on a wall, playing cards would be stuck, most of them blanks, some of them bearing winning numbers. If you touched a card with a winning number you got a prize — a tin of smoked herrings or of jam, a bottle of pickles or something of the sort. Usually you got nothing, for the lottery-place keeper was not a philanthropist and seemed to believe in the proportion of twenty blank cards to one prize-yielding card. But there was another method by which some person of a group playing was bound to win something. What he won was usually worth less than one half of the money put up to gain a prize. Six, eight, even twelve persons might decide to raffle for something. Each man threw dice, the man whose dice scored the highest number was the winner. This dice-throwing was the favorite form of lottery, and of course if you did not want any prize upon the shelves you could have money instead — for eighteen-pence subscribed by twelve players at penny-halfpenny per chance you might obtain in cash the extraordinary amount of sevenpence-halfpenny. One night, after most of the people in one of these lottery places had lost all their available cash — for if you gamble long enough you are going to lose everything — there were only two men left with money in their pockets. These, with the permission of the proprietor, started to gamble against each other. One man played quite honestly. The other began to cheat from the beginning. He would throw the three dice on the counter, quickly concealing one of them in his little finger, shake the other two dice noisily in the box, slam the box bottom upwards on the counter, and so won again and again. For the dice that he had manipulated in his little finger always showed the high number of six, and this of course was a boon and a blessing to him. But there came a time when justice favoured the unfortunate loser, who threw the miraculous figure of seventeen. Instantly the cheat yelled out, "You are robbing me!" thrust his arms round the waist of the other man and proceeded to do his best to hurl him to the floor. I as an onlooker, was stupefied. I had seen what had been happening from the start. It seemed to me an astonishing thing that a fellow who had been cheating consistently should dare to accuse his honest opponent of robbery because the dice went once against him. But so it was, and I do not know how the fight ended. I remembered that I had an appointment elsewhere — anywhere — and I left the precincts of that place with quite admirable rapidity. Not, however, before I had heard exclamations from the other spectators in favour of the cheat: they had evidently not observed what had been happening and their sympathies were with the man who had been winning — on the principle, I suppose, that he who loses is lost, and that it is wisdom to kick a man when he is down. Perhaps I should in justice add that both the fellows who had been playing against one another had been drinking, but I think the cheat would have been a cheat even had he been sober. He looked like one. But I did not tell him so. I did not wait to tell anybody anything.